Unfortunately, metal theft has been a problem across the UK for many years. However, recent statistics show that metal theft in the UK has decreased by an average of almost 74% between 2012 and 2016. 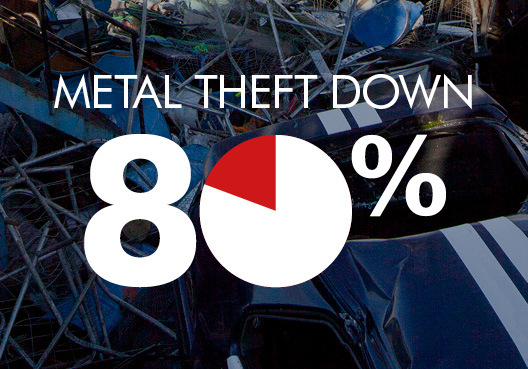 From 2012-2013, reported metal thefts totalled 44,885. But, from 2015-2016, this figure fell to 11,747 – representing a 73.83% decrease in incidents. Manchester in particular has seen one the highest decreases in theft, at a reported drop of 78.86%. This is the sharpest fall of all areas throughout the entire North of England. These reassuring stats are largely thanks to the introduction of the Scrap Metal Dealers Act in 2013. The act, preventing unlicensed metal trading, has contributed to numbers falling; since 2012, reports of metal theft have dropped consistently year-on-year across the country, with declines in incidents of up to 89% for places including Leicester, Kent and Somerset. Sorted into two categories – infrastructure-related, and non-infrastructure-related – metal theft incidents were high back in 2012, with metal stolen from roofs, railways, building structures, as well as gates and fences, in order to sell on for monetary gain. Pressure on an industry that was blighted by this type of crime paved the way for the introduction of the act, forcing many illegitimate firms that would tolerate these actions to go out of business. Now, all metal traders are required to have a license to do so, leaving behind only the reputable companies with the right licenses. The decline in metal theft crime is celebrated by contractors, railway workers, and council members alike, with millions saved every year on costly replacements to metal infrastructure. Scrap metal theft is more than just an inconvenience – recyclable metals are a valuable income stream for many businesses, and the cost and time taken to re-secure premises after intrusions can be hugely disruptive too. Choose the right company to scrap your metal – give J Davidson a call today. This article was posted in Scrap Metal, Scrap Metal in Manchester, Scrap Metal Theft. Bookmark the permalink. Follow comments with the RSS feed for this post.Both comments and trackbacks are closed.